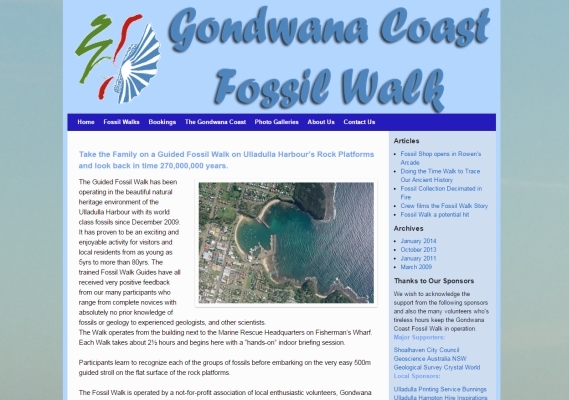 Just prior to Christmas 2014, I was approached by my neighbour Phil Smart to assist his volunteer organisation ‘The Gondwana Coast Fossil Walk’ – could I rescue and assist them with their website? Naturally I was only too happy to also volunteer to help such a good cause and create a website they could easily self manage and get their ownership back on track. We got through a few tricky times much aided by Phil’s constant management and aided by clear objectives I was able to pull a newly laid out website design together. Significantly we were able to reduce their website Domain and Hosting costs, provide a full content management site based on WordPress and will via my tutorials have volunteer editors, pleasingly they were delighted with the results.